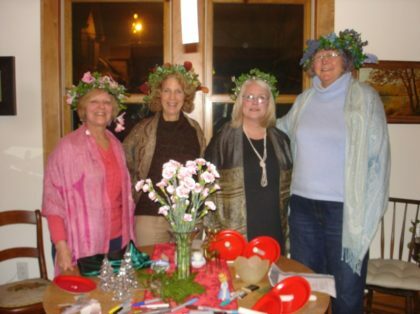 Left: Ceile Hartleib, Maryah Wolszon, Abby Struck and Lois Hamilton at a Solstice Service. 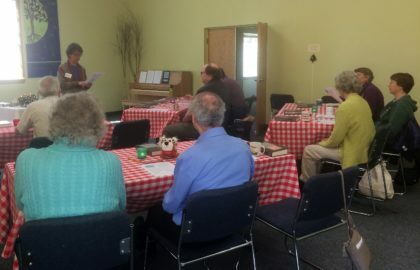 Middle: Poetry Café with Ginny Allery presenting. 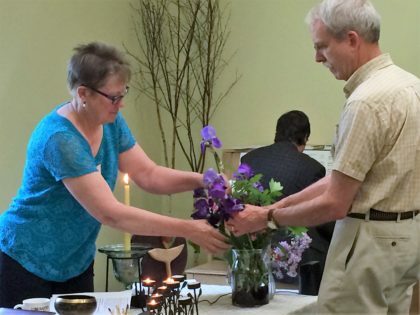 Right: Judith Bonhiver and Bruce Jarvis with Paul Hjelmstad in background at Flower Communion and New Member Ceremony. Groveland Fellowship holds services several times a year in recognition of specific events. In the fall, we have our Welcoming Back service, using water as a symbol of coming back together after a summer away. Around late October we have a Day of the Dead service. 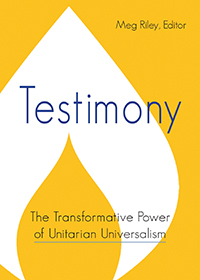 In December, we celebrate a solstice service usually accompanied by a potluck. In May, we have a Flower Ceremony where we all bring flowers for a community bouquet, and where we welcome new members in a formal book signing. Other services that are recurring, although not necessarily yearly, are: Poetry Cafe, Music Sunday and Drumming.